Moroccan tagines and belly dancing meet meatball parmigiana. 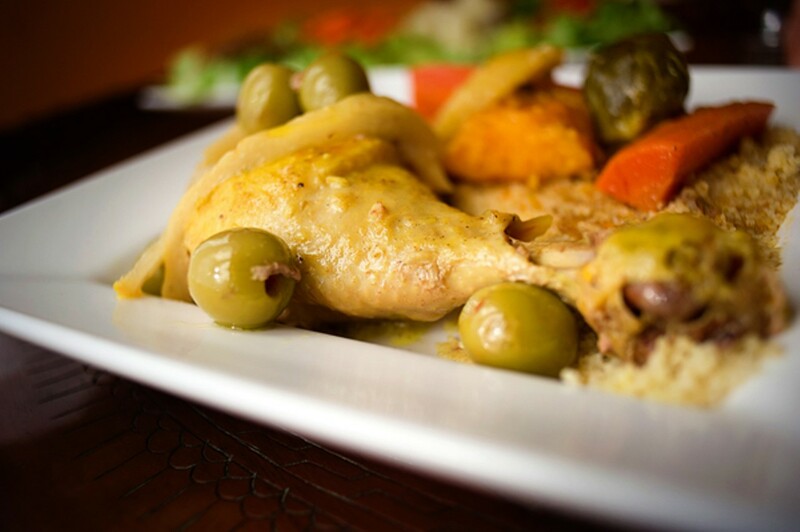 The tagine-style chicken is braised with green olives and preserved lemon. Hours: Tue.-Sun. 10 a.m.-4 p.m., Sat. 6-10 p.m.
For most of the week, Abigail's Moroccan Cuisine is indistinguishable from your typical sandwich shop. The casual Alameda lunch spot is, at first glance, notable mostly for its close proximity to the bay and its generous BYOB policy (no corkage fee!). It's an appealingly sleepy little place where you can grab a meatball sub or sip a glass of mint lemonade while lounging on the outdoor patio, which faces San Francisco Bay. Nothing about the cafe seems particularly Moroccan, the ethnicity of husband-and-wife owners Jonathan and Fatima Belkhalfia notwithstanding. But on Saturday nights, Abigail's (named after the Belkhalfias' eight-year-old daughter) comes to life. That's when the restaurant offers a prix-fixe dinner featuring a lively belly-dancing performance and some of the best-tasting Moroccan food I've encountered in the Bay Area. Let's put it simply: $25 for a hearty multi-course dinner, live entertainment, and however much booze you care to drink (as long as you bring it yourself) is tough to beat. Open since 2010, Abigail's has stayed mostly under the radar, even among Alamedans, in part because of its remote location. To get there, you have to drive clear across the island to Ballena Isle (a little C-shaped plot of land that hangs off the southwestern-most edge of the city), past a cluster of townhouses, until finally you reach a nondescript office complex. It's not a restaurant that anyone is likely to stumble upon; you have to seek it out. But even the regular lunch menu is worth the detour. Oddly enough, the menu mostly consists of sandwiches you'd normally find at an Italian-American deli: a cold-cut sub, various permutations of parmigiana, and so forth. A Brooklynite friend of the Belkhalfias had given Fatima, who is the chef, some pointers; later, she added her own embellishments. It turns out that Abigail's is one of the few places in the East Bay where you can get a proper East-Coast-style meatball parmigiana, which is available as a sandwich or a lunch platter: In that latter format, four humongous beef meatballs, seasoned with a hint of vaguely Middle-Eastern spice, came covered in tomato sauce and melted mozzarella. The meatballs were chewier than I would have liked, but the sauce was good, especially when scooped up with the crusty bread that came on the side. Better yet was the Moroccan kefta sandwich — North Africa's answer to the meatball sub — which featured the same meatballs, paired with caramelized onions and sautéed tomatoes, and served on a toasty roll. Somehow the meatballs were juicier here; they made for a killer combo with the onions. And the Moroccan harira, an off-menu special, was a fragrant chickpea-and-lentil soup that had a lovely, faintly herbaceous quality. On Thursdays, there's also a more substantial Moroccan lunch special — a baked fish fillet, sometimes, or one of the tagines normally served for dinner. Still, the best time to try Abigail's is Saturday night. Our prix-fixe Moroccan feast started with a platter of assorted salads, brought out practically as soon as we sat down. There was a simple potato salad; soft, sweetly pickled carrots cut into ridged coins; and roasted red peppers that could have come straight out of an Italian deli case. My favorite was the zaalouk aubergine, a garlicky, cumin-y roasted eggplant mash. As far as entrées go, Abigail's keeps it simple: The only options are the lamb or the chicken, both of which are slow-cooked, "tagine-style," in big pots. The lamb was a whole shank that came covered in sesame seeds, sliced almonds, and dried plums that had been cooked until they plumped and caramelized. 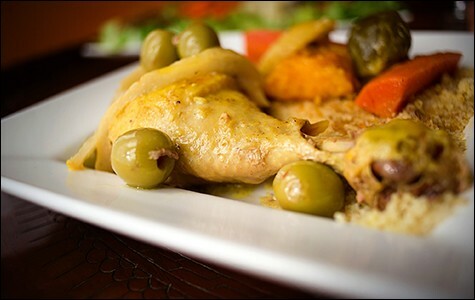 The chicken, a hefty leg, was braised with briny green olives and slices of house-made preserved lemon. Each entrée came with steamed vegetables (cut into gigantic chunks) and was served on top of a bed of delicate and flavorful couscous, which had soaked up all the juices from the braised meats. Both the lamb and chicken had been cooked until perfectly tender, so that the skin and flesh fell apart with the slightest nudge from the fork. But the meats also had the same flaw: They were underseasoned, which was especially problematic with the lamb, since the dish needed more of a savory quality to balance the sweetness of the plums. The remedy, it turns out, was house-made harissa hot sauce, which is available by request. The fiery, slightly tangy chili sauce made every bite taste at least twice as good. For dessert, there were glasses of hot, sweet Moroccan mint tea and a plate of ghoriba, a kind of nutty shortbread cookie. By the time we paid our bill and were ready to leave, the dancer had just started pulling people up from the crowd to join in. So, sadly, I missed out on the opportunity to, as the kids say, shake what my mama gave me. It was just as well.